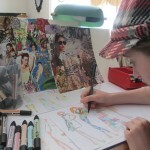 Ami has been running freelance creative workshops since 2007. She has a PTTLS teaching qualification and is an Arts Award trained Advisor in Discover, Explore, Bronze, Silver and Gold. In 2015 Ami completed her Youth Arts Management Qualification with Bucks University. 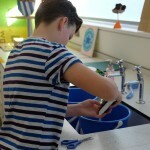 *School workshops, both one off after-school craft sessions and bigger projects involving the whole school. Ami also has a lot of experience managing budgets, ordering materials, liaising with clients and has made successful funding bids for various creative projects. 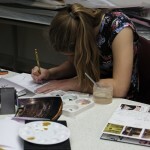 From 2009-2011 Ami was the project worker on a £50K Heritage Lottery Funded workshop through Making Space. She has since worked on a further two HLF projects, a second through Making Space, offering marketing support, and a third independent successful bid in conjunction with Staunton Country Park. 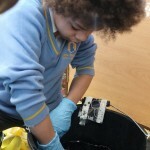 In the last few years Ami has made connections with many local cultural partners leading various projects with local schools. A couple of these projects were part of an Artswork funded project called Strong Voices. If you are interested in commissioning Ami for any kind teaching job, or would like to chat about the possibility of working together on a project, please give email. Below are a few recent teaching experiences to give you an example of Ami’s knowledge and skills. 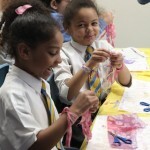 A Moment in Time was a textile project with Arc Dickens School in Portsmouth and the NMRN. Over 3 weeks I worked with all students in year 3 & 4. 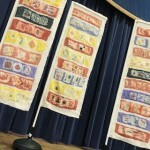 120 children made batik signal flags and sailor keepsakes. The artwork went on display at The Sea Life Roadshow in Buckland, Portsmouth in March 2016. In October I was approached by Making Space to lead one of two free community textile projects inspired and focussed around the D-Day Museum and the sensational Overlord Embroidery. 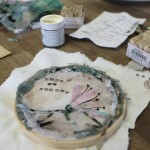 My idea was to use peoples personal responses and heritage to inspire a range of creative textile samples in different sized embroidery hoops. 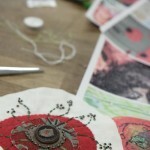 Over a series of 8 free sessions a beautiful selection of work was made. 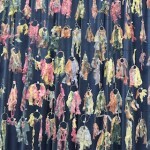 The artwork went on show at a celebratory event at The D-Day Museum in November. I have just finished another year of ‘fashion School’, a weekly class for 11-16yr olds who have an interest in fashion, design and textiles. I have been working with students over the last year working towards a end of term fashion show which took place on the 7th July 2015. 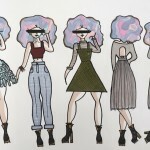 The group designed a illustrated collection and completed four collections, Gypsy Skirts, Shibori printed kimonos, Applique T-shirts and Tie Dye jersey Dresses. 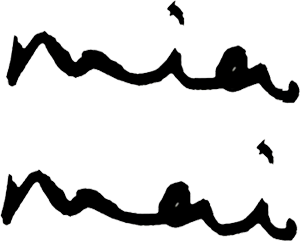 2014 – 2015, September – February. Strong Voices – Woodlands Camouflage. I was asked to manage a second Strong Voices project for the Arts Award funded scheme. I worked with the Woodlands Education Centre for young people who cant attend mainstream schools due to behavioural difficulties and Warblington School in Havant. The project partnered with the National Museum for the Royal Navy and the project ran weekly from September 2014 to February 2015 in the form of weekly 2hr sessions. 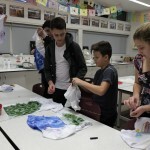 The young people used camouflage as a theme and their trip to the museum as inspiration to experiment with various textile techniques and design and make a range of T-Shirts. 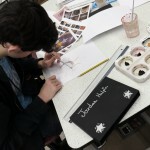 As part of the project I also took all the students successfully through their Bronze Art Award. 2014 October. St Johns Scarecrow Project. I was asked to work with every student at a Rowlands Castle Primary school creating scarecrows based on story book characters for a larger Scarecrow Trail. 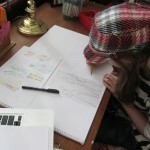 The workshops took place over two weeks working with one class at at time. 2014 June – July. 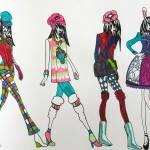 Fashion School for Summer. I was asked by a local mum who home-schools her children if I could lead a 6-wk programme for her daughter who has an interest in fashion and design. I planned a varied and exciting project for us where Summer had the chance to design a collection based on her own mood boards, make a dress from scratch, learn basic sewing machine techniques and arrange and model in a photoshoot. You can see more about the project here. I was asked to take the creative lead on a Strong Voices project working with disadvantaged young people and local cultural partners. You can find out more about the project here. Over a few months I worked with 15 Yr9 students and we customised a range of iconic duffle coats inspired by what they had seen and learnt at the NMRN. The project received fantastic feedback, all participants received their Bronze art Award and the project finished with a fashion show at a celebration event at Portsmouth Guildhall and a photoshoot about 2 of the iconic boats in the Historic Dockyard. I was asked to come on board to be the artist for a project working with 2 infant and junior schools in Gosport. 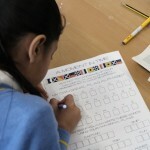 I worked with over 120 children designing and making badges based on the iconic ships badges that they had seen during and inspiration visit to The Historic Dockyard. 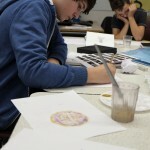 As well as designing and making their own personal badges which told something of themselves, they also all helped make a large A1 School badge as a legacy for the project and school. I handled the budget and all materials/ liaising with the school in conjunction with the staff at the NMRN. 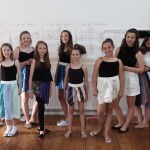 I run a tuesday night Fashion School for 11-16yr olds at the Spring Arts and Heritage Centre in Havant during term time through the years. 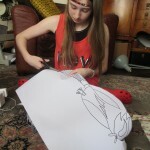 The young ladies work with me on a variety of individual projects such as draper, tie dye, fashion styling, illustration, dress making, accessory design, customising and much much more. 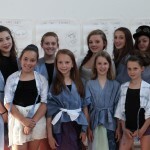 For the past two years we have put on a fashion show finale to celebrate the years work. You can find out more about the course and details on how to book on here. 2013. HLF – Windows into the Past Project. Through a strong relationship with Staunton Country Park we came up with and put in a successful bid to the Heritage Lottery Fund to do a project which would begin the restoration of the historic Gothic Library. We worked with 6 local junior schools and a local stained glass artist to put in 9 temporary window installations and 2 permanent stained glass windows designs and made using the children’s drawing and inspiration. As well as leading all the in-school sessions I also was in charge of all the interpretation work which was left as a legacy of the project. The work can still be seen in the windows of the Gothic Library at Staunton Country Park. 2013. 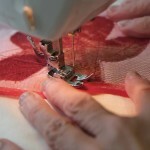 Private weekend textiles workshop. 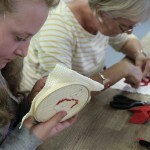 I was approached by a mother and daughter who wanted a private weekend workshop learning a variety of textile techniques. 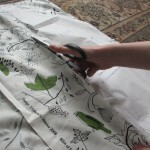 I hired studio space at Making Space and the ladies enjoyed a relaxed weekend workshop and went away with a huge increase of knowledge and fabric samples. 2013. Making Space Kids workshop.